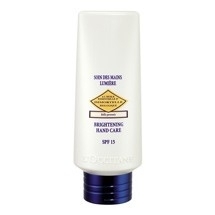 For smoother, more beautiful hands try the Immortelle Brightening Hand Care SPF15. Its formula is enhanced with beauty benefits from the Mediterranean “flowers of light,” Immortelle and Bellis Perennis (Daisy). Immortelle essential oil stimulates collagen production to fill wrinkles,while Bellis Perennis extract, combined with a vegetal complex, evens skin tone and diminishes existing age spots. Finally, UV filters have been added to protect your hands from the harmful effects of sun rays. Immortelle grows abundantly on the coast of the Mediterranean Sea and has an exceptionally long life. Immortelle flowers produce an essential oil that boosts collagen synthesis, stimulates cutaneous micro circulation to enhance cell renewal. Bellis Perennis, the daisy flower, opens its petals each day with the sunrise and closes them at dusk. Its flower offers a brightening extract that contributes to reduced melanin synthesis. I am really suprised withthis hand cream,i love L'Occitane products. The cream itself is really light in texture and sinks into skin so amazingly fast that i felt i needed to apply even more straight away. Unlike other L'OCcitane products i really didnt like the scent of this hand cream at all. Disappointed and not really impressed. "I am really suprised withthis hand cream,i love L'Occitane products. The cream itself is really light in texture and sinks into skin so amazingly fast..."